Your cell phone can act as a mobile “hotspot” to allow your rig to access the internet. If you don’t have offline BG data setup, setting up Bluetooth (BT) tethering to allow your rig to connect to the internet through your phone can keep your rig looping as you move around areas without known wifi networks. Hotspot is a feature of your phone AND cell phone provider. Please check with your cell phone provider and your service contract to confirm that hotspot internet connections and BT tethering are available. Hotspot, when activated, uses your cell phone’s data. Know what your cell phone plan data limits are and consider if you want to change/update based on your frequency of hotspot use. You can get an estimate of cell data use by resetting your cell data use, at the beginning of the day, within your phone. BT tether: BT tethering (also known as BT PAN Personal Area Network) requires your phone and rig to be BT-paired before they can connect (that’s what this section of the docs is specifically about). The advantage of connecting to your hotspot via BT tether is that it will happen automatically. You do not have to remember to toggle hotspot. Simply leave your hotspot toggled on as usual, leave the house, and within a few minutes (or sooner) your rig will BT tether to the hotspot. (Screenshot below shows what you’ll see in your network logs as you move from known wifi network to BT tether. Oref0-online will automatically find BT tether and connect.) Your rig will then use your cell phone as its internet connection. When your rig comes back into a known wifi network, it will automatically drop the BT tether and connect with the wifi network. Wifi connection: You need to set up your wpa_supplicant list to include your hotspot information; network name and password. The wifi signal for the hotspot is not constantly broadcast by your phone, however. So when you want to use the wifi connection to your hotspot (for example, you are leaving your home wifi network and traveling), you will need to manually toggle your hotspot on so that the phone will broadcast a wifi signal for the rig to connect to. The other consideration is that since this is a wifi connection, the rig will not automatically disconnect when you come into one of your other known wifi networks. You will have to remember to manually disconnect (toggle hotspot off), if you do not wish to continue using cell data when you are home. Hotspot done by wifi connections also use more phone battery than a BT tether connection. USB plug: You can plug devices into your cell phone to use hotspot. However, the phone would pull battery power from your rig and would drain your battery fairly quickly. This is not a recommended connection method for openaps use. Certain phones don’t work well using bluetooth tethering with OpenAPS. Various users have experimented, and the list below shows those that have been found to work okay, those that don’t and those with variable effectiveness. If you have something that is not on the list, please feel free to add it. Google Pixel 3XL with Android 9 Yes Supports tethering to both Wifi and Cellular network. No issues switching. Google Pixel 2 with Android 8 Yes Supports tethering to both Wifi and Cellular network. No issues switching. LG Nexus 5X with Android 7 Yes Supports tethering to both Wifi and Cellular network. No issues switching. Works well with Dexcom G5 and xDrip. No issues with compatibility. 90%+ capture rate. Google Pixel with Android 7 Yes Supports tethering to both Wifi and Cellular network. No issues switching. Works well with Dexcom G5 and xDrip. No issues with compatibility. 90%+ capture rate. Sony Xperia Z5 Compact with Android 7 Yes Works with tethering for network access. It regularly disconnects from the rig (which doesn't seem to affect data flow) and roughly every 24-36 hours this results in complete loss of connectivity and requires a full reboot of the rig and the phone. Doesn't work well with phone swapping between Wifi and mobile - causes BT dropouts that require a reboot of the rig. No issues running xDrip/xDripAPS alongside the tethered connection. Achieves 90%+ packet collection from Dexcom G5. Xiaomi Redmi 4 with MIUI 8 (Android 6) No Tethering can be set up, but it drops regularly requiring rig reboots. When phone switches between Wifi and cellular signal requires rig to be rebooted. Significant packet drops and data becomes almost unusable. Xiaomi Redmi Note 4(X) -Snapdragon SoC version!!! Yes Tethering works in same time with Blukon(Nightrider) and SW3 connected. Also, read Notes for MIUI below* Excellent coverage. Xiaomi Redmi 3 with MIUI 6 (Android 5) Yes No issues seen when tethered to cellular network. Doesn't allow tethering to wifi. Works fine with Dexcom G5 - 90% collection rate. Xiaomi Mi A1 with AndroidOne (vanilla Android 8.0) Yes OpenAPS bluetooth tethering works fine with Blue Car Autotether. Not tested with Dexcom. Samsung Galaxy S6 (Android 7) Yes Tethering to rig and cellular works okay. No data on swapping between cellular and wifi connections. Use with Dexcom G5 and rig not effective. Significant packet loss. Samsung Galaxy Junior Yes Phone tethering switching between wifi and mobile not elegant and causes some issues Difficulties found when using xDrip with the OpenAPS tethering. Packet loss occurs. iPhone Yes Users have experienced various levels of success with the iPhone bluetooth tethering and when the rig switches between wifi and BT Not Applicable. Experimental version of Loop to do something similar doesn't yet have feedback. Acer Phone No Many data drops on the bluetooth connection for rig. Recommended to avoid. xDrip compatibility is poor - numerous drops throughout the day. Samsumg Galaxy S7 Edge (G935F) Android 7.0 Yes Excellent BT tether using apps 'Bt AutoTether' and 'BT Tether' xDrip+ with G5 > 95% capture. Elephone P9000 Android 7 Yes Seems to work well, switching on/off BT tehethering as expected. Using 'Blue Car Tethering' with rig selected. Tested with phone screen off, works fine. Samsung Galaxy A5 (2017) Android 7.0 Yes Excellent BT tether, intermitent disconnecting when the area is flooded with other bluetooth devices. Use 'BT AutoTether' app along side to maintain connection xDrip+ with G5, works really well with G5 transmitter directly, no compatibility issues and 95%+ consistent capture rate. Motorolo Moto Z Play Yes Excellent BT tethering; highly reliable using Blue Car Tethering. Not tested (using Enlite sensor). Wiko Wim Lite Intermittent Works most of the time. Note, several issues with this phone: 1) NSClient has a tendency to crash on this phone and 2) Bluetooth tethering works intermittently with Blue Car Autotether and not at all with BT AutoTether. Note that this phone has a tendency to freeze and reboot on its own, so I think the phone itself is the issue. Not tested (using Enlite sensor). Xiaomi Mi Mix 2 with LineageOS 15.1 Yes Excellent connectivity - has worked almost flawlessly with tethering. Battery life has also been very good. Works brilliantly with xDrip+ and G6 - capture rate typically more than 95%. Nokia 2.1 with Android 8.1 Oreo Go Edition Yes Excellent bluetooth tethering to cellular network. No noted network drops. Works excellent as an offline option with XDripAPS. Awesome battery life(4000mAH) Works well with Dexcom G5 and xDrip. No issues with compatibility. Generally 95%+ capture rate. OnePlus 6 (A6003) with OxygenOS 9.0 Yes Excellent connectivity - Tethering has been good and picks up right away. Battery life very good and really fast charge. xDrip+ w/ G5 - capture rates generally better than 98% on current nightlies. This section is completed by the install method found here http://openaps.readthedocs.io/en/latest/docs/Build%20Your%20Rig/OpenAPS-install.html#copy-and-paste-to-run-the-wifi-and-oref0-setup-scripts . If you selected the option of installing Bluetooth at a later time during installation you may skip to Bluetooth Setup, the next section. You will need to get the MAC address from your phone or whatever device you are using. NOTE: Make sure the MAC address is in ALL CAPS. Copy and paste the “To run again with these same options” command into your notes for the next time you need to run oref0-setup. The first time running the script will take quite a bit longer as it is installing Bluez on your edison. The oref0-setup script may fail after installing Bluez. If so, just reboot your edison and run the setup command you copied to your notes. You can confirm that Bluez has installed properly by using bluetoothd --version. If Bluez installed properly, a version number of 5.37 or greater will be returned. If it did not install properly, you will likely see 5.28. The procedures below will not work with the outdated version, so make sure you get version 5.37 or greater installed before continuing. Ensure that your wpa_supplicant.conf file doesn’t contain any content that will interfere with oref0-online. First check the wpa_supplicant.conf file to make sure it is set up to allow oref0-online to change between connections. Delete the phrase update_config=1 from the file if it is present. As shown in the “success” section below, you should see a single line returned with a short string of numbers and then be returned to a clean prompt. 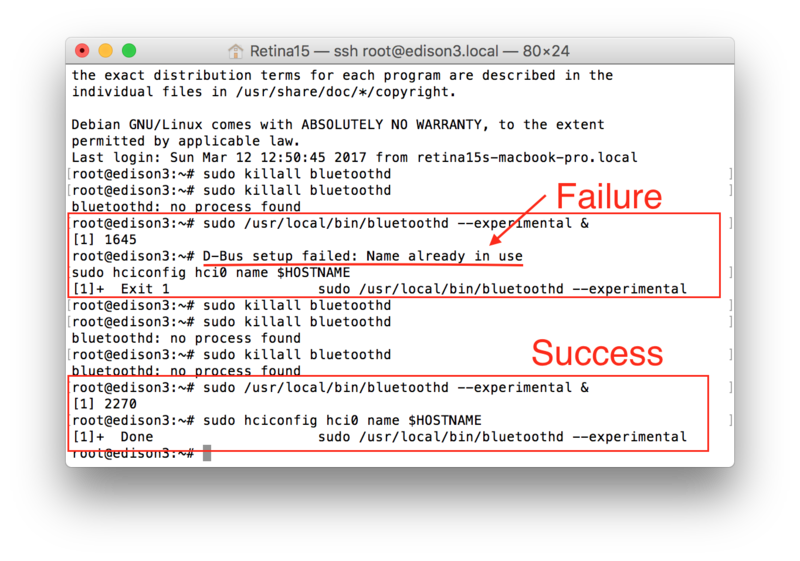 If you instead see messages about D-bus Setup failed (as shown in the “Failure” part of screenshot), or otherwise see that you don’t have a clean prompt returned in order to enter the next command...go back to the sudo killall bluetoothd and try again. If you get a Can't change local name on hci0: Network is down (100) error, run bluetoothctl, then power off and power on, then exit and try sudo hciconfig hci0 name $HOSTNAME again. The adapter is now discoverable for three minutes. Search for bluetooth devices on your phone and initiate pairing. The process varies depending on the phone and the dongle in use. The phone may provide a random PIN and bluetoothctl may ask you to confirm it. Enter ‘yes’. Then click ‘pair’ on the phone. On your phone, tap the pair button that popped up. Troubleshooting note: If after the pair AA:BB:CC:DD:EE:FF command you get a response of Failed to pair: org.bluez.Error.AlreadyExists, that means you likely have already tried to pair previously...but have run into problems getting it to run properly. Double-check that your cell provider allows for personal hotspots and bluetooth tethering. Make sure you have enabled those for your device. If you have confirmed those, you can remove AA:BB:CC:DD:EE:FF and start at the sudo commands again to attempt a fresh pairing. Quit bluetoothctl by typing quit and then enter. Make sure your phone’s hotspot is enabled, but don’t let anything connect via wifi (you have to switch on the personal hotspot toggle, but then immediately back out of the personal hotspot screen before anything connects to your hotspot via wifi). You should see an indicator on your phone (a blue bar on iPhone) that your Bluetooth network connection has established. About 1 min later, your rig should connect to your phone with Bluetooth (blue bar will pop up on the iPhone). If it doesn’t, you should be able to wait 3 minutes and your terminal session should automatically reconnect. If that doesn’t connect, you’ll either need to reboot it or use a serial console connection to your Edison to troubleshoot further. 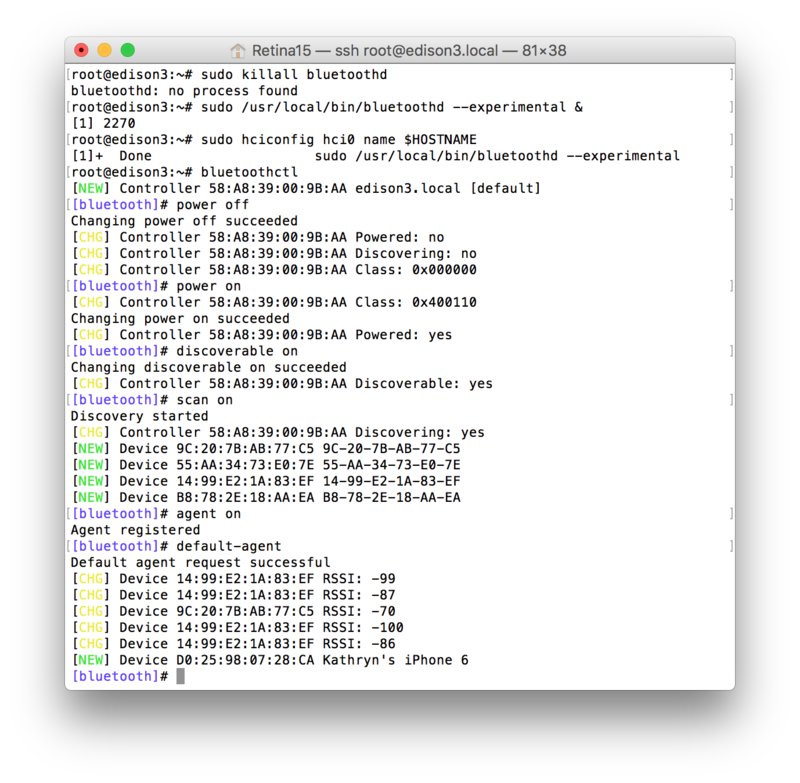 About a minute after wifi comes back on (terminal session restores), your Edison should automatically disconnect the Bluetooth connection. Finally, it’s time to take a walk. About a minute after walking out of range of your home wifi, you should see that a device is connected to your phone via Bluetooth. Shortly after that you should see things update on Nightscout. About a minute after you come home, it should reconnect to wifi and automatically disconnect Bluetooth. On Android, the Bluetooth tether will shutdown if there is no tethering request within 3 minutes. Installing the application “BTAutoTethering” on your phone from the Play store will resolve this issue and allow the rig to switch to your phone when out of wifi range with no manual intervention. If you’re using an Android phone, see if your rig can access the internet when your phone is logged into a wifi network. If it can, the issue may be with your carrier. Try setting up a tethering connection between your phone and another device (e.g., your laptop) to see if the laptop is able to share the phone’s mobile connection. On at least one carrier (Ting), setting up a connection from a PC resulted in a prompt on the phone to activate sharing the phone’s mobile connection via Bluetooth, which then resolved the issue. If all else fails and you have isolated the problem to your mobile connection, consider contacting your mobile carrier’s tech support for help as they may be able to do something on their end.